Last week, the cryptocurrency market capitalization exceeded the $200 billion threshold for the first time in history. According to Coinmarketcap, a resource monitoring 1254 digital currencies on 6400 online exchanges, Bitcoin was the biggest market driver of the market-cap rally. The thing is that Bitcoin gained more than 25% last week by setting another all-time high at 7300 USD/BTC, with $124 billion of market cap. For the sake of comparison, in early 2017, Bitcoin was under 1000 USD/BTC, NordFX analysts report. How long will the Bitcoin rally last and how high the BTC value will go? According to Ronnie Moas, CEO of Standpoint Research, Bitcoin will reach $11000 in 2018, $20K in 3 years and $50K in 10 years. It should be noted that Mr. Moas is often referred to as an optimistic analyst. However, most of his predictions do become true. For example, in July 2017, when Bitcoin cost under 3000 USD/BTC, he predicted its growth up to $5000. This is exactly what happened in September 2017. 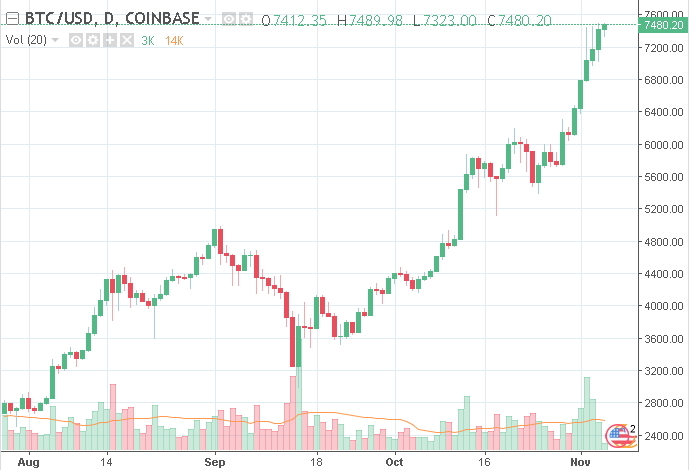 In August, he predicted a rally up to 7500 USD/BTC. At this point, the price is somewhere around and may reach the expected level in a couple of weeks or even days. Every day, more and more editions start mentioning Bitcoin in their headlines. More and more countries are putting up with Bitcoin and accepting it, the experts says. He claims that only 0,5% of the world population are investing in Bitcoin these days but the number is definitely going to grow in the near future, pushing the price even higher. According to Lloyd Blankfein, CEO and Chairman of Goldman Sachs, cryptocurrencies can really make serious rival to conventional currencies over time. During his speech at Sustainable Finance Innovation Forum, the head of a major investment bank (one of the world’s biggest ones actually) confessed that he feels slightly uncomfortable when it comes to digital currencies. However, he felt so about each and every new technology out there, including the invention of mobile phones.